Sometimes we can dream, make plans and see our dreams come to fruition, but then a couple of cats come along and sabotage our dreams in a flash. As a landscape designer, I’ve been trained to try and plan for everything when designing a site; accessibility, location, exposure, sight lines, potential hazards, storage, screening, water, fire, gardens, pets, allergies… the list goes on. Somehow, in the years I’ve been doing this, I was never trained to envision that new cats will move into the neighborhood 4 or 5 years down the road and use your dream project as a toilet. Unfortunately, it happens and it has happened. I’ve been gardening for many years and have had rabbits destroy plants, squirrels steal fruits and veggies to take a bite out of them and leave them behind and deer do pruning for me. While all of those things are annoying, it is nothing like finding your neighbor’s cats’ waste in the space that you grow food in. It is infuriating, disgusting, repulsing and when you have a young child, dangerous to their health. When I discovered the cat mess in my garden, I knew immediately I needed to stop this from happening again, but in the back of my mind I also knew the damage had already been done and can’t be fixed so I would need to come up with a new plan. I know for a fact these cats kill birds and rodents on a regular basis so the likelihood of the cats having toxoplasmosis is pretty high, meaning it’s also in their poo and likely in our garden now. So what am I going to do about it? Revamp, renew and revive. I’ll be honest, when I first started thinking about how to handle this, my first thought was to gather the poo and deliver it to my neighbor’s doorstep, but I didn’t think that would be appropriate or make for a very good neighbor relationship. It could be argued that neither is moving into a new neighborhood behind a nature center, feeding the birds and then letting your cats out to kill the birds, spray your neighbor’s house and use their garden as a litter box, but I digress. Poo delivery is out. I also thought about fencing, but we already have a privacy fence around the back yard and since we live on a corner, we are restricted on both the height and location of the fence, not to mention fences can be costly. Plus, a fence in front of a fence wouldn’t look so hot and… cats can jump. Fencing is out. I thought about putting a deterrent spray or powder around the garden, but I would have to be diligent about applying it in order to (hopefully) keep them out. Not what I want to spend my summer doing. Spraying is out. I thought about getting a motion activated sprinkler, but I know myself. I would sit there smugly thinking I’ve got them, evil laugh to myself envisioning the cats being startled, hair standing on end and getting sprayed and then promptly forget that the sprinkler is on and end up being the recipient of the cold blast of water instead of my neighbor’s cats. Sprinkler is out. Finally, I settled on the plan I was really dragging my feet on… move the garden. It’s hard to say goodbye to 5 years of planning, planting and work, but it really seems like the best option. It’s time to revamp the front garden and move the food to the back yard. So the new plan for the front is to leave the honey berry, currants and perennials where they are and turn the veggie space into a cutting flower garden. This will allow the space to be utilized for something attractive and still stay in line with my chemical-free “bee safe” yard and better yet, turn it into a pollinators paradise. My loss turns into a win for the pollinators. I call that a win-win. On to the renewal and revival! The back yard garden was all but abandoned over the past few years with my energy being focused on the front yard garden, pregnancy, new baby and lack of time. Now that I’m past the initial anger of the situation, and our newest is old enough to hang out with me in the garden, I’m really embracing the revival of our back yard. Here’s a little peak as to what I’m doing with the raised beds. Any guesses? More on that in the near future! Happy spring, happy planting and cheers to an abundant season! 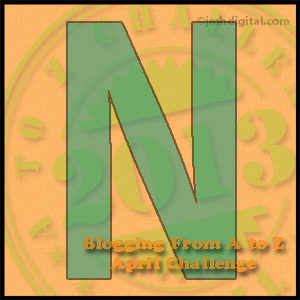 I realize this is a bit of an odd post, and it wasn’t what I had intended on posting for “N” (the original post is about nitrogen fixers in the lawn and garden, but we’ll get to that another day). Instead, this is a public service announcement. April 19, 2013 – Natura Pet Products is voluntarily expanded its March 29, 2013 recall of dry pet foods because they have the potential to be contaminated with Salmonella. The expanded recall now includes all dry pet food products and treats with expiration dates prior to and including March 24, 2014. I’m using this post for this notification because I first heard about this recall last night on the news and I figured that if I hadn’t heard about it until now, there might be others that missed this information as well. Salmonella contamination can make our pets sick as well as transfer to other animals and humans. If you use one of the above listed brands, please visit the Natura website for further information about this recall. I just wouldn’t feel right letting Thanksgiving go by without writing. I had actually planned on writing prior to Thanksgiving Day, but that just wasn’t meant to be. A few days before Thanksgiving I came down with the flu, you know, the full-blown body aches, fever, struggle to get out of bed flu. Actually though, I was blessed. It wasn’t the stomach flu. And for that I was very, very thankful! Nonetheless, I didn’t want the holiday to go by unacknowledged. With all the craziness of the Christmas buying season starting as far back as October, pausing just long enough for all of us to take a few bites of turkey and a piece of pumpkin pie and then start right up again, I think it’s really important to stop, take a breath and look around at what really matters. Our health matters, our family and friends matter, having a roof over our head and food on the table matters, being loved matters. There are so many negative things that we could focus on in the world right now that could be better, but it’s so important to take some time, pause and reflect on what’s going right. What are we thankful for? This year my health is something I’m incredibly thankful for. You know that saying “you don’t know what you’ve got ’til it’s gone”? I’m so grateful to have my health back. I know I’ve mentioned it before, but the past couple of years were scary. What’s weird is that when the fevers ended at the end of May and my fatigue started to fade away I thought things were good. At the time I had no idea how much had changed over time. Over the past six months the fever has stayed away and my energy level has continued to increase, so much so that I don’t even recall when the last time was that I felt this good. Even having the flu last week didn’t bother me. Okay, I mean it wasn’t fun, and it wiped me out at the time, but it was different. Plus, I knew it would pass in a few days or so. In addition to my health, I’m so thankful for my family and my friends. My family and friends are my world. They shape my life and are there for me to lean on when I’m not feeling strong. I have an incredible support system all of whom I’m very thankful for. I know it may sound corny to some, but I’m thankful for my pets too. To me, pets are a little piece of God. They make me laugh, they snuggle when I’m down or need a hug. They have definitely challenged me to make me a stronger person. And at the end of the day, no matter what I’ve said or done, no matter how the rest of the day has gone, they are there for me, giving their unconditional love. And my dear friends, I’m thankful for all of you, who take a couple of minutes out of your busy days to stop and read my blog. I appreciate you. I appreciate your comments. I read them all and appreciate the feedback. I hope everyone had a blessed and Happy Thanksgiving.